attempting to wrap leather strands around Mark's tattooed arm. sure I want to change anyways..."
Flashback to a Sunday in Crown Heights. A Shliach approaches the Rebbe. men? How should I respond?" What the Rebbe was saying is that every Jew is meant to do Mitzvos. Lubavitchers don't change peoples lives. LIFE changes peoples' lives. twisting your soul and ignoring the way you really are deep down. eyes. Why? Because it was all inside of you, waiting to be revealed. You stretched out your arm and your inner temple woke up." Jewish soul can truly find any Mitzva ridiculous. into convincing people, into changing people. resurrect souls, and bring assimilation to it's knees. And they do it all without changing a thing. I used to think that Lubavitchers wore black hats. he doesn't have to bring his hat box. For what hat? this going to be a hat function?". let it slip, she'll probably get a response like "What do you mean?". girls list of 'things to look for" in a guy. to why he's not wearing one. cigarette, hanging out with girls, or dancing to non-Jewish music. He doesn't have two personalities - the "hat me" and the "non-hat me". Lubavitcher actually DOES wear a black hat. it on his hatless fellow Jew. always wear black hats? Do you all think you're Rabbis or something?" places the hat on the boy and helps him with the tefillin. they're not talking about Lubavitchers. And Lubavitchers? Well, they just don't wear black hats. Simply, because we see the faults in other people. Loving another Jew often seems beyond our means because it's hard to fully accept and love another when we so visibly see their faults. However, people who seem good in our eyes - well, they are easy to love. There's no challenge there. So what do we do with the challenge of loving another Jew while seeing their faults? How can we rise above...? There are different levels of approaching the faults in others as it relates to loving a fellow Jew. The first, portrayed by Reb Zusha, is unnatainable by us. Reb Zusha was aware of the hardship involved in loving other Jews. So what did he do? He begged G-d to take away his ability to see people's faults. He recognized percieving others' faults as a huge barrier, and he couldn't deal, couldn't tolerate it. So G-d fulfilled his request and he lived the remainder of his life totally blind to the faults of others. In a sense, everyone became perfect to him. And the love flowed. 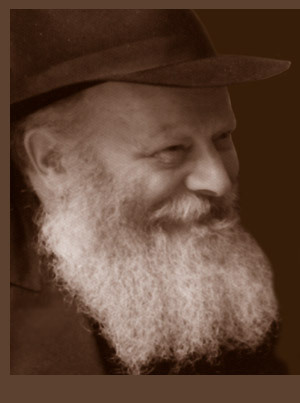 Then there is the Berditchiver Rebbe. The Berditchiver was able to reach a level where he witnessed faults in other people and turned them into actual virtues. For instance, the famous story where he saw a Jew smoking a ciggarette on Shabbos. The Berditchiver assumed that this man forgot it was Shabbos. When the man informed him that he in fact DID know it was Shabbos, the Berditchiver turned to G-d and said "See, G-d, how honest are your people!". When a 99 year-old women in his community decided, on her deathbed, to "convert" to Christianity he proclaimed "Look how she managed to hold off for so many years!" So the Berditchiver lived a life constantly choosing to turn others' faults into virtues. And then along came the Baal Shem Tov. The Baal Shem Tov didn't even try to remove himself from seeing other peoples' faults. In fact, he actually engaged them. He simply loved people IN SPITE of their downfalls - not because they didn't have them. His approach was "why do we have to turn everyone into a Tzaddik to love them?!". What kind of a joke is that? I can find love for you without blocking out your faults. So the Baal Shem Tov had no internal struggle, no fiery need to downplay or erase the wrong within his fellow Jew. And it wasn't his job anyway. Who am I to interfere? This is supposed to be a love without conditions - why bring your faults into this? So, unlike Reb Zusha, we are not able to blind ourselves to the faults in others. And yet, we are commanded to love each other. The Baal Shem Tov insisted that one doesn't have to be in a cloud about another's faults to accept and love him. When I imagine a world where every single person internalized this approach, a see light and power and sanctity and action and beauty and a strong and limitless forward motion. And it all starts with you and me. "Many names for one G-d..."
"Singing to their Ta to rebuild the Temple...."
You're strongly in my thoughts. I can't wait to sing and dance when it all breaks loose. I finally have my ticket. I am leaving in four days. That's it - four days. It's funny. After waiting and waiting around, so desperate to go, I actually have the date and...now I am wishing I had more time. It seems like I always either have too much time, or too little. But, I guess we all have these sort of love-hate relationships with the tick-tock in our lives, right? When I called to tell my brother Saadya that I finally got my ticket to Israel, he told me that he sensed something new in my voice - a certain excitement. Meanwhile, I was hearing excitement in HIS voice, and the reality hit. I thought "Some one else is in on this with me, its real" - sort of like in the movies when the kid sees a ghost and has to call his friend over to make sure its real, that he's not just seeing things. Well, I guess that's what Saadya's excitement did for me. After talking to him, the first person I called to tell, everything felt calm. But I dunno, shouldn't I be going crazy? Stressed? Nervous? Rushing a little? Afterall, I've got only four days. But nope. I'm sitting here rambling away on the computer while an empty suitcase sits idly on my bed, waiting for me. Which reminds me! I have an empty suitcase sitting idly on my bed waiting for me. So I’m leaving for Israel soon. How soon? Finally booking a ticket will tell, but it’s for sure within the next coupls of weeks, and I am so ready. I am ready for cobblestone. I am ready for tense deeply-felt politics. I am ready for the Friday rush. I am ready to be cheated of my money. I am ready for the Chanukah buzz. I am ready for no strangers. I am ready for near misses in a taxi. I am ready for peoples’ stories. I am ready for water filters. I am ready for true hospitality. I am ready for the bus to come. I am ready for my brothers and sisters. I am ready for Israel. I thought this could all end here. I am ready. I am ready. I am ready. But, reading that over, I am realizing it all came out so strong and sure, when really I am harboring such nervous, edgy – even fearful - feelings. I’m thinking. I am thinking about riding taxi’s alone. I am thinking about making Shabbos plans. I am thinking about money. I am thinking about calling cards. I am thinking about the highs and lows of inspiration. I am thinking about a thin mattress. I am thinking about getting sick. I am thinking about expectations. I am thinking about rules. I am even thinking about laundry. Why am I thinking of these petty things? This is ridiculous. I know that I have no memories of being in Israel and being afraid. I know that I have goals. Goals unlike any I’ve ever had, that I am thrilled and anxious to pursue. I know I love the streets, the mountains, and the people where I will live. I don’t care about a thin mattress, and I for sure know how to take care of my laundry. Why am I so scared? I mean, come on. I’ve done this Israel thing before! Oh man, okay… that’s it right there. I know what’s scaring me. I’ve done “this Israel thing” before, yes. But this time around, I don’t want it to be “this Israel thing”. I want it to be different. Much different. And it’s all in my hands. Right now, where I stand in life, I have one thing to chase. And you know what? I’m certain I can befriend those fears that will accompany me on the ride. And that’s what I have to keep telling myself. So, yes - I am ready. Let’s get me out of here.